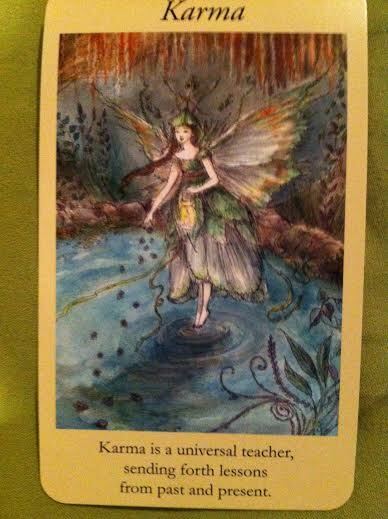 Card: Karma – from the Faerie Reflections oracle cards by Paulina Cassidy. Message from the Faeries: Happy 2014 Everyone!!! Yay! You all made it to this year! Amazing! We are so proud of all of you. We are also so very excited for you, because this year is going to be such a great year. This is definitely the Year of Karma. More poignantly, this is the year where you all truly learn the laws of attraction, and the laws of cause and effect. For every action that you make – thought, word and deed – there is a reaction. We want you to use this fully to your advantage! Be the creators that you are! Create the world that you want to create! With your thoughts, words and actions, create the world that you want to be living in. You are finally starting to realize that you are not a victim in this world and that you are responsible for everything that is happening to you in your life. This very moment is a culmination of all of your actions (and reactions) up to this very second. The quicker you truly grasp the concept of karma, the sooner you will have this world in the palm of your hand. Karma is not a bad thing. You are not being punished for anything. Karma is simply about how all of your actions have lead you up to this moment. Is that really such a bad thing? From where we are sitting, your Karma is looking pretty great. Keep up the good work! We would also like to point out to you that this is the Year of Karma because all of your hard work from last year, all of your trials and tribulations, are going to pay off. That’s right, this is your Pay Day year. You have all worked so hard at your life lessons, and you have all learned some really important things about yourselves. While the learning journey is never over – as you are always creating new karma – this is a time of reward and higher learning. Higher learning is a huge reward within itself, but we think you deserve all the things that you have worked hard towards in the last year. All of your dreams and desires will come to you much easier this year, as you have cleared and paid off much of your karmic debts to yourself. We hope that you have opened your arms and your hearts to 2014. Open yourself to receive all of the good karma that is coming your way. Also, be mindful of all that you say, think and do – you now have the awareness and wisdom to know that what you say, what you think and what you do have a monumental impact on your day to day life. The choice is always yours. Be the fully conscious creator that you came here to be. We love and support you, always.